Polyethylene amine functionalized with boron hydride Nano-Cerium was used as reactive polymer revival. The reagent was found to be efficient and selective in the reduction of aldehyde sand ketones to the corresponding alcohols in high yields at room temperature. The re-agent exhibited good chemo selectivity in the reduction of aldehyde sand ketones. In the competitive reduction of a 1:1 molar mixture of benzaldehyde. 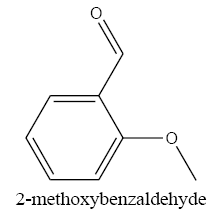 Benzaldehyde was selectively reduced to benzyl alcohol. The spent resin could be recycled by treating with sodium borohydride. The recycled resin was used several times without much loss in chemical reactivity and mechanical stability. The Poly Ethyleneamine-Cerium Methoxy Bohrohydride was found to be more efficient than was the Merrifield resin in the preparation of the reagent as well as in the reduction reactions. Insoluble polymeric reagents have acquired high popularity and have found wide applications in various fields, particularly in the fields of synthetic organic chemistry [1,2]. Polymeric reagents have the physical properties of the macromolecular support and the chemical properties of the bound reagent function. The ease of the reaction workup, nontoxicity and recyclability are the intrinsic advantages of polymer-bound reagents. over the low molecular weight reagents . A number of synthetically important polymeric reagents have been reported so far, of which polymer bound reducing agents have a significant contribution. Polymer-supported Poly Ethyleneamine-nano Cerium Methoxy Borohydride were reported to be good reducing agents. selectively in the presence of carbonyl compound and polymer- bound alcohol has a significant selectivity in the reduction of ketones in the presence of aldehydes [4,5]. We reported the preparation of Poly Ethyleneimine-Cerium Methoxy Borohydride by the reaction of sodium borohydride Nano, cerium chloride and polyethyleneimine. Since 1995, polyethyleneimine (PEI) is the most widely used cationic polymer for nucleic acid delivery in vitro and in vivo [6-8]. Its molecular weight or structure (linear or branched) can influence the transfection efficiency . The advantages of PEI include its ability to condense and protect DNA and provides the proton buffering capacity for endosomal escaping [10,11]. Furthermore, the application of PEIs has also been extended towards siRNA delivery recently [12,13]. However, the high cytotoxicity of PEI becomes a major concern when utilizing high molecular weight or high N/P ratio of PEI to deliver DNA or siRNA into mammalian cells [14,15]. To overcome this drawback, several approaches are made such as using the lower molecular weight PEI, conjugating with biocompatible moieties (e.g., PEG), or a biocompatible or biodegradable polymer [16,17]. Given the large size and the negative charge of nucleic acid, chemical modification of inorganic nanoparticles with functional groups or polymers is generally needed. Positively charged functional groups (usually the amide groups) or polymers, such as amino silane, polyethyleneimine (PEI), polyamidoamine (PAMAM), chitosan, are usually be employed to treat the nanoparticles before binding with DNA. For instance, PEI grafted GO exhibited enhanced chemotherapy efficacy towards HeLa cells by sequential delivery of anticancer drugs and siRNA [18,19] Aldehydes and ketones are similar in reactivity. The development of methods for the chemo selective reduction of aldehydes in the presence of ketones has therefore received considerable attention or by using additives such as thermoplastic, (PET, ABS, SAN), [20,21] nano tube [22-24] resins [25-27], graphenoxide  in water. 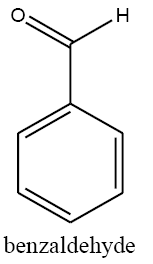 Poly (ethyl aminemolecular weight 10,000 and by the Aldrich Chemical Co. (Milwaukee, WI)., sodium borohydride from Spectrochem, and benzaldehyde, acetophenone, 2-nitrobenzaldehyde,4-methoxybenzaldehyde, 4-cyano benzaldehyde from Qualigens (Mumbai, India) were used. The Analar-grade solvents dichloromethane (DCM), THF, dimethylformamide (DMF), and were purified according to the standard procedures. 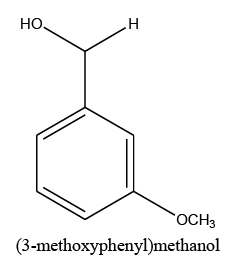 The dry resin (1 g) was swollen in Methanol (50 mL) and refluxed with in the presence of 1 g CeCl3 in (20 mL) chloroform, at 60°C for 12 h. After the reaction, the resin was filtered and washed with methanol, The IR spectrum of resin showed a characteristic C-Ce stretching band at cm. 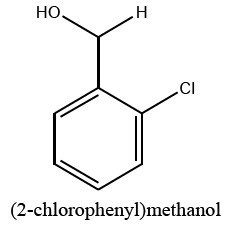 The polyethylene cerium chloroide resin (1 g) was swollen in ethanol (20 mL) and then shaken with sodium borohydride (3 g) in diethylether (20 mL) and 1 ml methanol. After 15 h, the resin was filtered and washed with ethanol, and ether capacities of resins were estimated by the iodometry method. In a typical procedure, to a suspension of the polyethylene-nano cerium methoxy borohydride (0.2 g) in (50 mL) of different solvent such as dichloromethane (DCM), THF, dimethylformamide (DMF)and 1ml methanol, benzaldehyde (0.1 mL, 1 mmol) was added and then shaken for 6 h. The extent of the reaction was monitored by thin-layer chromatography (TLC). After completion of the reaction, 1M HCl was added to the reaction mixture and shaken for 2 h (filtered off the spent resin and entracted the filtrate with ether, dried the extract over anhydrous sodium sulfate and evaporated the solvent). The product benzyl alcohol was confirmed by TLC, IR, and UV spectroscopic methods. 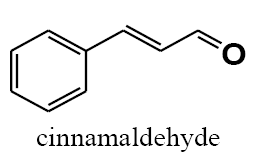 The same procedure was adopted for the reduction of substituted aldehydes such as o-nitrobenzaldehyde, p-methoxybenzaldehyde, p-cyanobenzaldehyde, and cinnamaldehyde to their respective alcohols with 100% conversion. The polymer-bound reagent (1 g) was swollen in THF (20 mL) and a mixture of benzaldehyde (0.1 mL, 1 mmol) and acetophenone (0.12 mL, 1 mmol) was added and then shaken in a water bath shaker. The extent of the reaction was monitored by NMR. Complete reduction of benzaldehyde was observed within 6 h. The reaction was continued for another 5 h and benzaldehyde in the reaction mixture was found to remain unreacted. One molar HCl was added to the reaction mixture and the organic phase was extracted with ether. 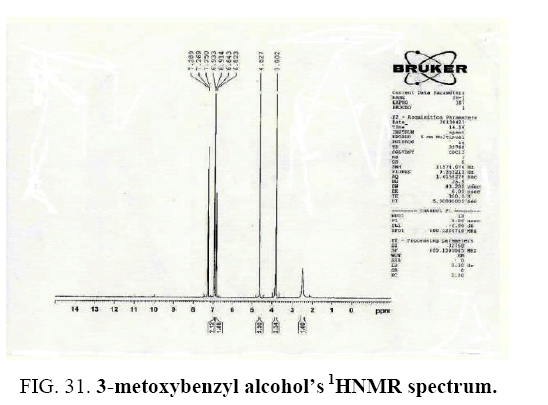 Only alcohol was obtained 1-phenylethanol as the reduced product, which was confirmed by NMR, and the unreacted benzaldehyde was separated by column chromatography. The polyethylene cerium methoxy borohydride resin (1 g) was swollen in DMF (10 mL) and the swollen resin was shaken with sodium borohydride (2 molar excess, 0.4 g) for 6 h. The The polyethylene cerium methoxy borohydride thus obtained from the spent resin was washed and dried. The utility of the regenerated resin was checked by the reduction of 2-nitrobenzaldehyde. The regenerated resin (100 mg) was swollen in DCM (5 mL), and to this suspension, 2-nitrobenzaldehyde (20 mg) was added and then shaken. The same reaction was carried out with the fresh resin. The reactions were monitored by TLC. 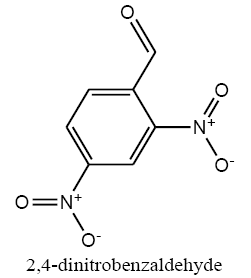 The time taken for a complete reduction of 2-nitrobenzaldehyde was the same (3 h) in both cases. The luche reagent was first prepared on a macro porous Merrifield resin. The polyethylene cerium chloride resin was converted to polyethylene cerium methoxy borohydride resin by treating with excess sodium borohydride in a diethylether methanol mixture. The capacity of the resin estimated by the Iodometry method. The IR spectrum of the resin showed a characteristic. The reduction reactions with the polymeric reagent were carried out at room temperature. 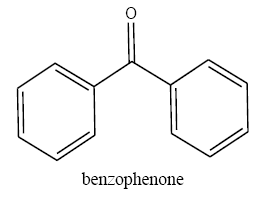 Using this polymeric reagent, benzaldehyde was readily reduced to benzyl alcohol. The reduction reaction was done with a 2-molar excess of the polymeric reagent. To the suspension of the reagent resin in THF, benzaldehyde was added, and the reaction mixture was shaken. The extent of reaction was monitored by NMR. After completion of the reaction, 1M HCl was added to the reaction mixture and the filtrate was extracted with ether and dried over sodium sulfate and the solvent evaporated. 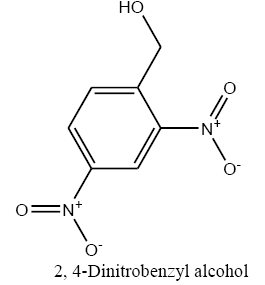 The product benzyl alcohol was confirmed by NMR, IR, and UV spectroscopic methods. 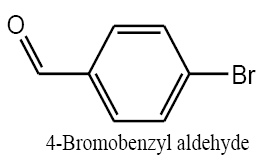 The polymer-bound reagent acted as a selective reducing agent for aldehyde in the reduction of a 1:1 molar mixture of benzaldehyde and acetophenone. An equimolar mixture of benzaldehyde and acetophenone was shaken with a 2-molar excess of the polymeric reagent suspended in THF. The reaction was monitored by TLC. Complete reduction of benzaldehyde was observed within 6 h. The reaction was continued for another 5 h and 1M HCl was added to the reaction mixture and the organic phase was extracted with ether. 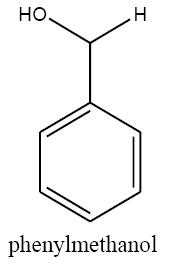 Only benzyl alcohol was obtained as the product, leaving acetophenone unreacted. The results are summarized in TABLE 1. In the reduction of benzaldehyde, the product benzyl alcohol was obtained only after acid hydrolysis of borate ester on the polymer beads. In the case of substituted aldehydes, the product was formed in the reaction mixture prior to hydrolysis. This may due to the stability of the borate intermediate offered by the steric hindrance of the substituents, which facilitated the cleavage of the alcohol from the polymeric reagent. In the reduction of nitro-benzaldehyde and cyano-benzaldehyde, increased reaction rates were observed due to the effect of electron-withdrawing groups which increased the rate of hydride transfer. The recyclability of the polymeric reagent was also tried. The polymeric reagent was regenerated by treating the spent resin with HCl followed by sodium borohydride and was characterized by an IR spectrum which showed the B-H stretching band at 2390 cm and the B-N stretching band at 1180 cm. The efficiency of the regenerated resin was checked by performing the reduction of aldehyde and comparing its reactivity with fresh resin. The time taken for 100% reduction of 2-nitrobenzaldehyde with the fresh resin and the recycled resin was the same. TABLE 1. 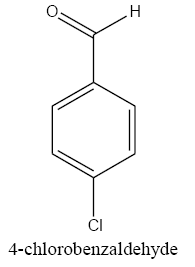 Benzaldehydes reduction to benzyl alcohol in various solvents with PEL-NCeBH2(OMe)2 with the presence of 1 ml methanol. As stated before, sodium borohydride (NaBH4) is a mild reduction factor capable of reducing ketones and aldehydes carbonyl group. This compound has no effect on organic acids, esters and amides; however, it transforms ketones and aldehydes to primary and secondary alcohols, respectively. 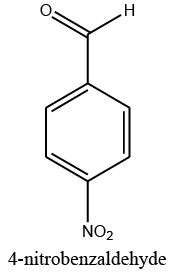 Up to present time, many reports have been published regarding organic compounds’ reduction via this reduction reagent; however, there has been no report in respect of preparation and usage of polyethylenimine (PEI) functionalized with nano-cerium methoxyborohydride. 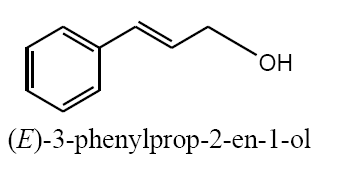 In the project, poly ethylenimine functionalized with nano-cerium methoxyborohydride has been prepared as a reduction reagent and used for reduction of several aldehydes and ketones. The study has been performed to the aim of preparation and production of poly ethylenimine functionalized with nano-cerium in reduction reactions of carbonyl group, and examining its related effects; so, linear and cross-linked poly ethylenimine have been used. To improve properties of cerium nanoparticles, they have been placed on polymeric substrate; and, prevention has been made from their agglomeration. Moreover, since particles are uniformly distributed on polymer substrate, active available sites would be increased; while, catalytic properties of nanoparticles will be improved. On the other hand, the nano catalyst acts as heterogeneous catalyst, when it is placed on polymer substrate. The results from these studies are reported, in this chapter. As it is understood, nano-cerium methoxyborohydride is a very unstable complex which may not be kept in laboratory environment. Nano-cerium methoxyborohydride used in organic synthesis of freshly prepared etheric solutions are very unastable, and flammable in the air. Placing this reducing reagent on linear or cross-linked polyethylenimine in the research, it has been successfully turned to stable and used as a reducing polymeric agent, remaining stable for a long time in laboratory environment (FIG. 1). FIG. 1. Polyethylenimine nano-cerium methoxyborohydride IR spectrum. At the time of adding the polyethelene carrying nano-cerium chloride to alcoholic NaBH4 solution, exchange reaction takes place and Cl-will be replaced with BH2(OMe)2. 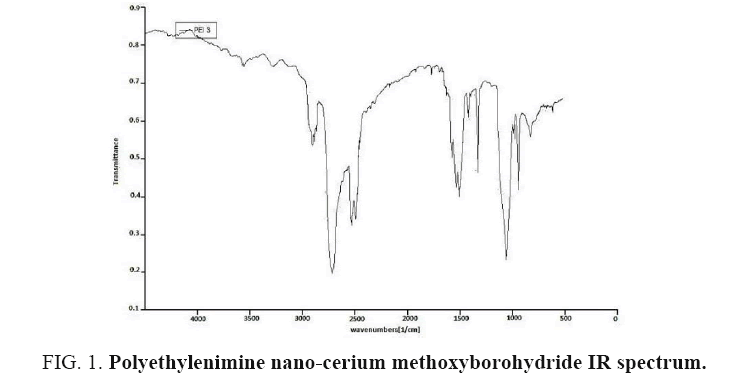 This way and according to what has been explained in empirical section, polyethylenimine nano-cerium methoxyborohydride has been synthesized. Some of empirical properties like glass transition temperature have been reported, for it. The obtained product will be separated through a simple filtration and then washed (FIG. 2). FIG. 2. 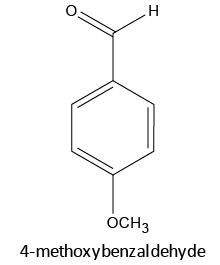 Polyethylenimine nano-cerium methoxyborohydride SEM. Some peaks within the range of 915 cm-1 are shown in IR spectrum which is indicative of metal-nitrogen bond. Also, tensile N-H and C-H-related peaks are observed both within the ranges of 10 cm-1 and 3000 cm-1, respectively. 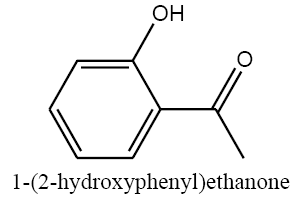 Several aldehydes and ketones have been reduced by polyethylenimine nano-cerium methoxyborohydride in the vicinity of such solvents as dichloromethane, acetonitrile, dimethyl sulfoxide, normal hexane, and tetrahydrofuran with presence of 1 ml of methanol, the result of which are presented in TABLE 1. As it is observed in the table, maximum efficiency is resulted in presence of methanol-tetrahydrofuran solvent. The solvent may penetrate the polymer substrate, resulting in its inflation. This results in polymer chains to become distanced from each other; and, allows penetrating the substrate through formation of some cavities. When substrate is placed in these cavities, methoxyborohydride zonal concentration will be increased, which in turn causes increase in reduction efficiency. Moreover, as it will be noted later this penetration into the cavity increases selectivity and makes distinction between various types of substrates. Considering price increase of polymeric reagents comparing to the monomeric ones, and also completion of the reaction for prevention of separation through difficult chromatography methods which is considered as one of distinguished properties of polymeric reagents, one of the principles in working with polymeric reagents is: selection of best amount of reagent in the substrate, to the extent of being capable of completing the reaction. 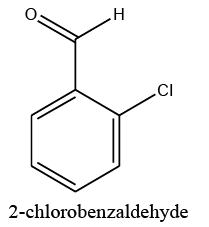 In doing so, benzaldehyde was tested as a sample aldehyde as for selection of optimized ratio of reagent, after selection of methanol as an appropriate solvent. The results are presented in TABLE 2. TABLE 2. Alcohols reduced from aldehydes and ketones. 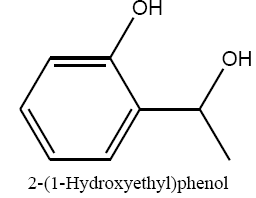 Aforementioned aldehydes and ketones have been reduced and turned to alcohol, using PEL-NCeBH2(OMe)2 polymeric reagent, according to the empirical methodology. The results along with efficiency and time required for the reaction are presented in FIG. 3 and 4. FIG. 3. General reaction in reduction of aldehydes. FIG. 4. 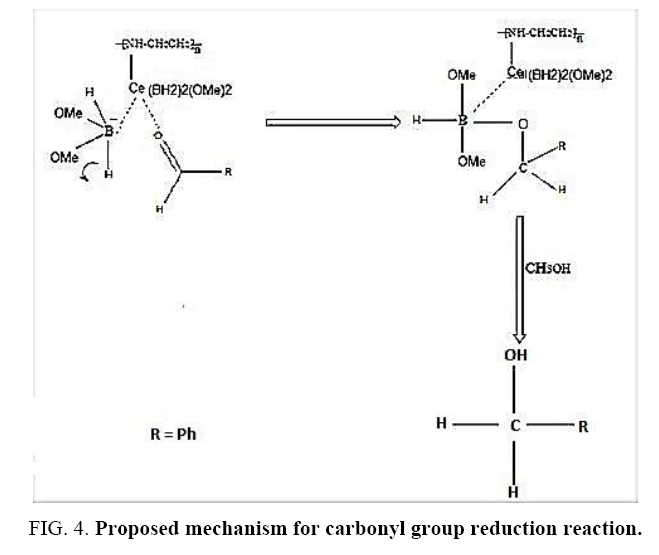 Proposed mechanism for carbonyl group reduction reaction. 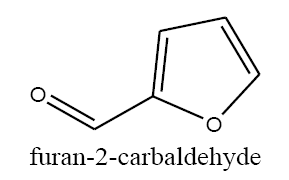 Benzaldehyde carbonyl group reduction (a) takes place in methanol solvent with the presence of polyethylenimine nanocatalyst functionalized by nano-cerium methoxyborohydride at room temperature, and the product would be benzyl alcohol (b) (FIG. 5). FIG. 5. (a) Benzaldehyde carbonyl group reduction to (b) benzyl alcohol. 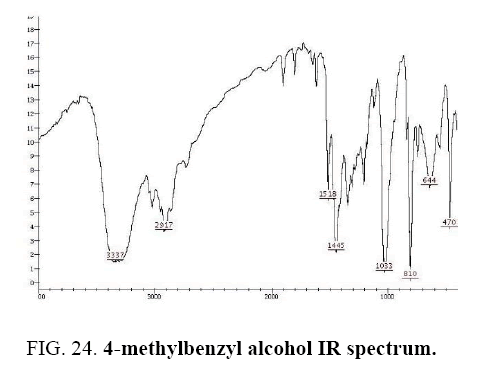 Benzyl alcohol IR and 1HNMR spectra of are shown in FIG. 6 and 7. In IR spectrum of the composition, the peak related to C-O tensile absorption and tensile O-H have been appeared within the ranges of 1017-1050 cm-1 and 3610-3640 cm-1, respectively. Meanwhile, C=C and aromatic C-H peaks have been observed in 1600 and 3100 cm-1 ranges, respectively. This composition’s 1HNMR spectrum includes the following data, 5.20-5.18, (1HNMR (DMSO-d6, 400 MHz) δ: 7.32- 7.20 (m, 5H (t, J=5.6 Hz, 1H), 4.51-4.49 (d, J=8.0 Hz, 2H). FIG. 6. 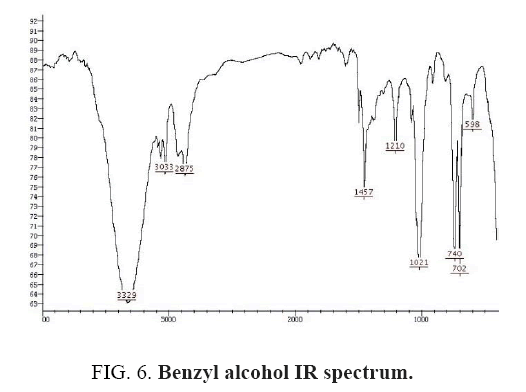 Benzyl alcohol IR spectrum. FIG. 7. 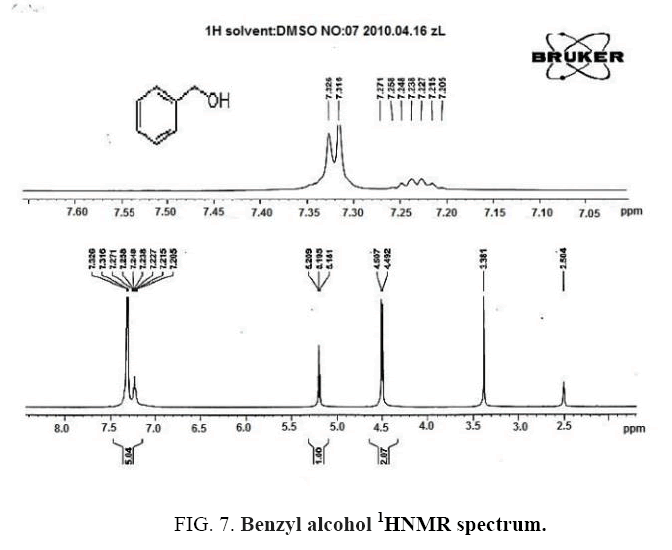 Benzyl alcohol 1HNMR spectrum. 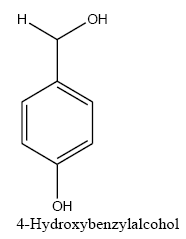 2-methoxybenzyl alcohol carbonyl group reduction (a) takes place in methanol solvent with the presence of polyethylenimine nanocatalyst functionalized by nano-cerium methoxyborohydride at room temperature, and the product would be 2-methoxybenzyl alcohol (b) (FIG. 8). FIG. 8. (a) 2-methoxybenzyl aldehyde carbonyl group reduction to (b) 2-methoxybenzyl alcohol. 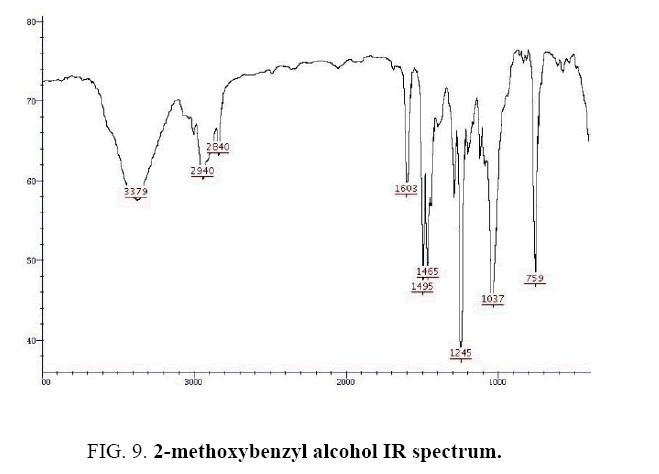 2-methoxybenzyl alcohol IR and 1HNMR spectra are shown in FIG. 9 and 10 In IR spectrum of the composition (b), the peaks related to C-O tensile absorption and tensile O-H have been appeared within the ranges of 1070-1100 cm-1 and 3630-3640 cm-1, respectively. Meanwhile, tensile C-H-related peak has been observed in 3000cm-1 range. This composition’s 1HNMR spectrum includes the following data: 1HNMR (CDCl3): 7.29-7.23 (2H, m, Ar), 6.96-6.86 (2H, m, Ar), 4.67 (2H, s, CH2), 3.84 (3H, s, CH3), 2.47 (1H, s, OH) in agreement with the Sigma Aldrich database. FIG. 9. 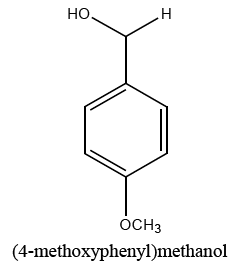 2-methoxybenzyl alcohol IR spectrum. FIG. 10. 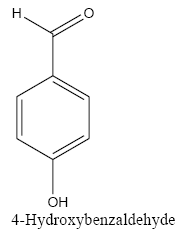 2-methoxybenzyl alcohol 1NHMR spectrum. 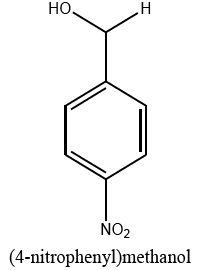 4-nitrobenzyl aldehyde carbonyl group reduction (a) takes place in methanol solvent with the presence of polyethylenimine nanocatalyst functionalized by nano-cerium methoxyborohydride at room temperature, and the product would be 4-nitrobenzyl alcohol (b) (FIG. 11). FIG. 11. 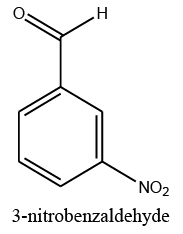 (a) 4-nitrobenzyl aldehyde carbonyl group reduction to (b) 4-nitrobenzyl alcohol. 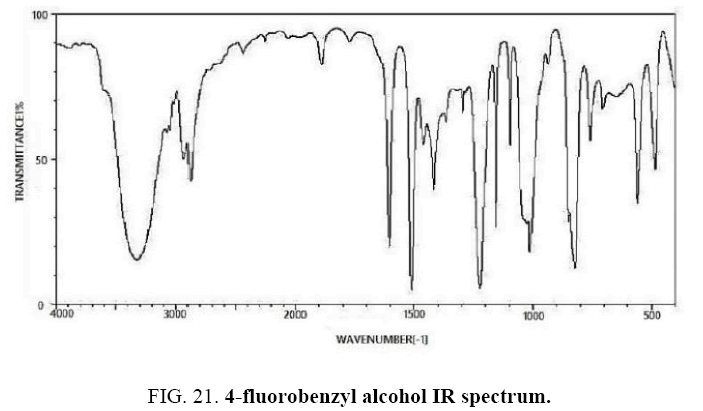 4-nitrobenzyl alcohol IR and 1HNMR spectra are shown in FIG. 12 and 13. 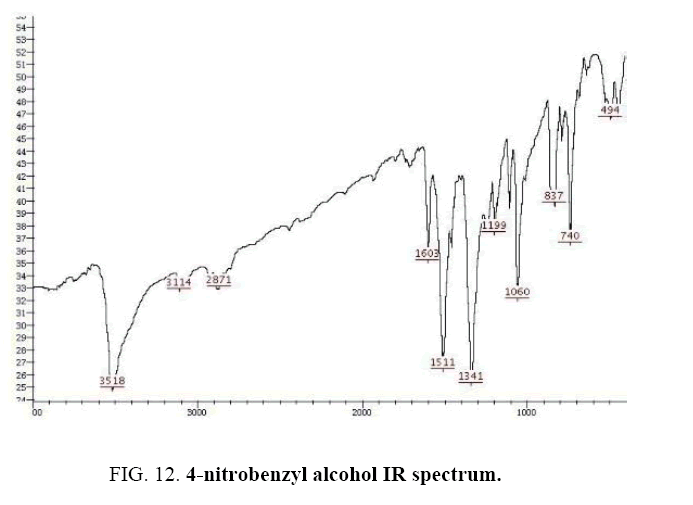 In IR spectrum of composition (b), the peaks related to C-OH and alcoholic O-H have been appeared within the ranges of 1100-1059 cm-1 and 3500-3522 cm-1, respectively. Meanwhile, the peaks related to sp2, CH, sp3, CH, aromatic C=C, and NO2 have been observed to be within the following ranges respectively: 3072-3082 cm-1, 2868-2925 cm-1, 1512-1603 cm-1, and 1344-1512 cm-1. FIG. 12. 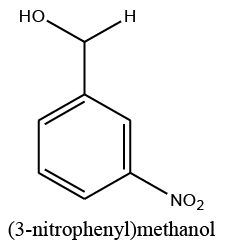 4-nitrobenzyl alcohol IR spectrum. FIG. 13. 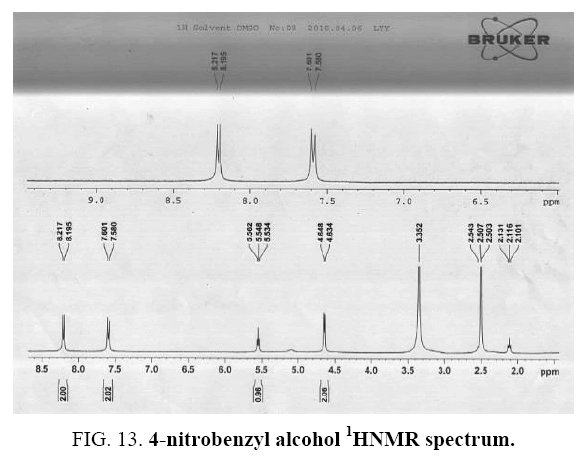 4-nitrobenzyl alcohol 1HNMR spectrum. (d, J=8.8Hz, 2H), 7.60-7.58(d, J=8.4Hz, 2H), 5.56-5.53 (t, 1H), 4.65-4.63 (d, J=5.6Hz, 2H). 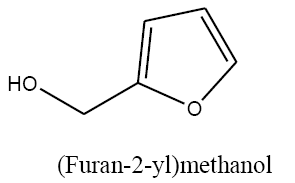 Furfural carbonyl group reduction (a) takes place in methanol solvent with the presence of polyethylenimine nanocatalyst functionalized by nano-cerium methoxyborohydride at room temperature, and the product would be furfuryl alcohol (b) (FIG. 14). FIG. 14. (a) Furan-2-carbaldehyde carbonyl group reduction to (b) furfuryl alcohol. FIG. 15. 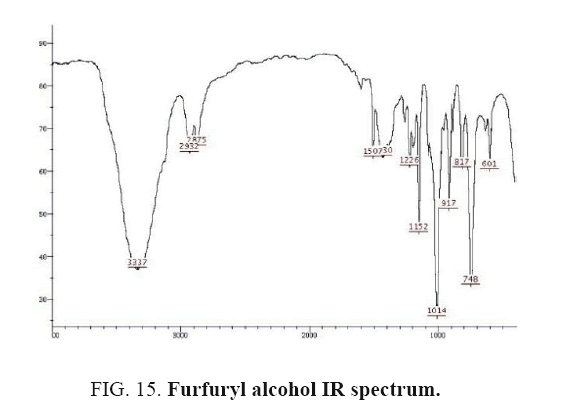 Furfuryl alcohol IR spectrum. FIG. 16. 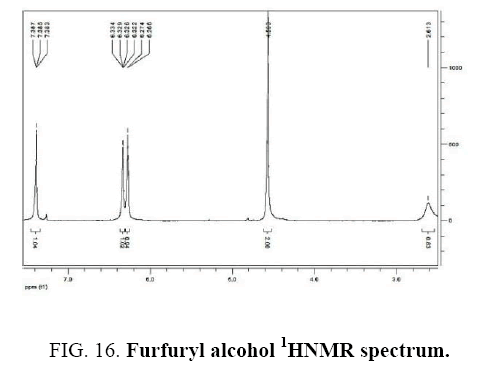 Furfuryl alcohol 1HNMR spectrum. Colorless liquid, 1H NMR (CDCl3, 400 MHz) δ: 7.39 (t, J=0.8 Hz, 1H), 6.32-6.33 (m, 1H), 6.26-6.27 (d, J=3.2 Hz, 1H), 4.56 (s, 2H), 2.61 (s, 1H). 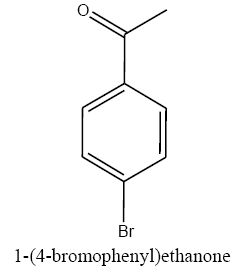 4-bromobenzyl aldehyde carbonyl group reduction (a) takes place in methanol solvent with the presence of polyethylenimine nanocatalyst functionalized by nano-cerium methoxyborohydride at room temperature, and the product would be 4-bromobenzyl alcohol (b) (FIG. 17). FIG. 17. 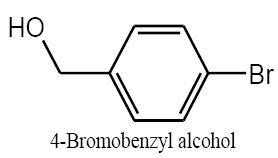 (a) 4-bromobenzyl aldehyde carbonyl group reduction to (b) 4-bromobenzyl alcohol. Bromobenzyl alcohol IR and 1HNMR spectra are shown in FIG. 18 and 19. In IR spectrum of the composition (b), the peaks related to C-O tensile absorption, and tensile O-H have been appeared within the ranges of 1017-1050 cm-1 and 3440 cm-1; while, those peaks related to C=C and aromatic C-H have been observed to be within the ranges of 1600 and 3100 cm-1. Also, Br-related peak has been observed within 600 cm-1 range. FIG. 18. 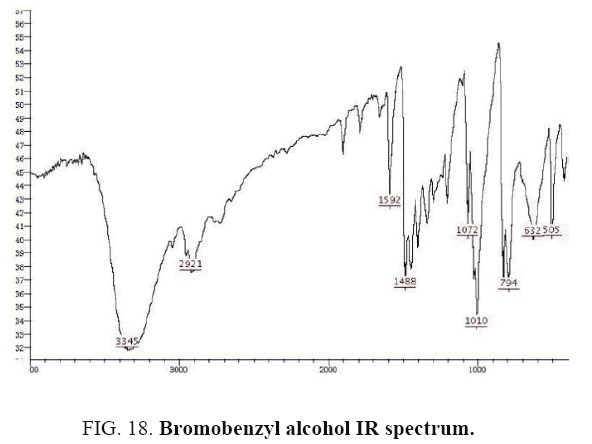 Bromobenzyl alcohol IR spectrum. FIG. 19. 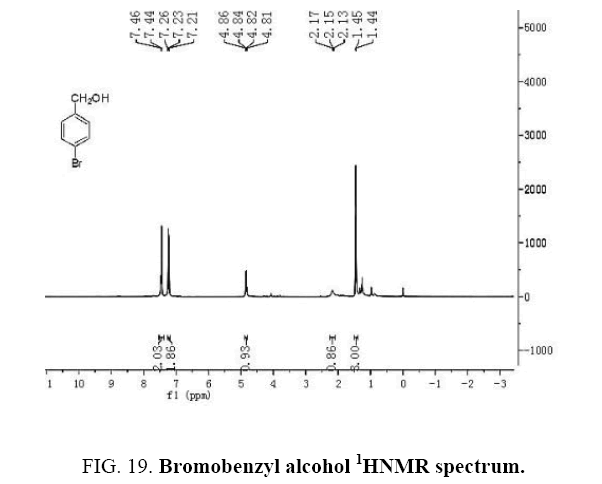 Bromobenzyl alcohol 1HNMR spectrum. White solid, 1HNMR (CDCl3, 400 MHz) δ: 7.30-7.36 (m, J=8.8HZ, 4H), 4.67 (S, 2H), 1.73-1.70 (t, J=5.6 HZ 1H). 4-Fluorobenzaldehyde carbonyl group reduction (a) takes place in methanol solvent with the presence of polyethyleneimine nanocatalyst functionalized by nano-cerium methoxy borohydride at room temperature, and the product would be 4-fluorobenzyl alcohol (b). 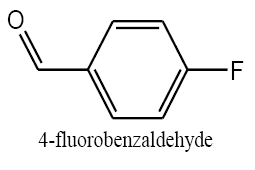 4-Fluorobenzaldehyde carbonyl group reduction (a) takes place in methanol solvent with the presence of polyethylenimine nanocatalyst functionalized by nano-cerium methoxyborohydride at room temperature, and the product would be 4-fluorobenzyl alcohol (b) (FIG. 20). FIG. 20. (a) 4-Fluorobenzaldehyde carbonyl group reduction to (b) 4-fluorobenzyl alcohol. 4-Fluorobenzaldehyde IR and 1HNMR spectra are shown in FIG. 21 and 22. In IR spectrum of the composition (b), the peaks related to C-O tensile absorption and tensile O-H have been appeared within the ranges of 1017 cm-1 and 3610-3640 cm-1, respectively; while, those peaks related to C=C and aromatic C-H have been observed within the ranges of 1600 and 3100 cm-1, respectively. Also, F group-related peak has been observed within1000-1400 cm-1 range. FIG. 21. 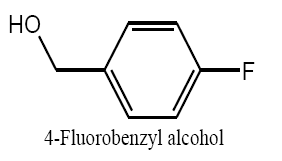 4-fluorobenzyl alcohol IR spectrum. FIG. 22. 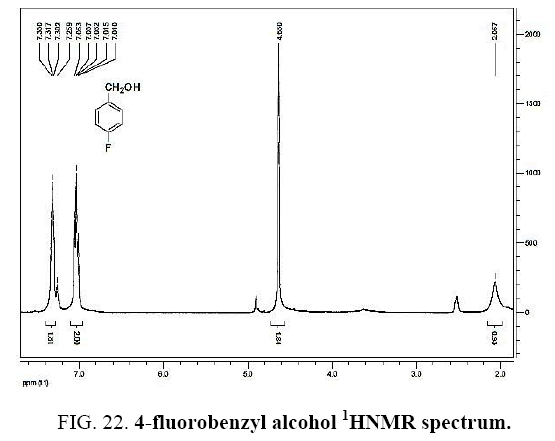 4-fluorobenzyl alcohol 1HNMR spectrum. 4-methylbenzaldehyde carbonyl group reduction (a) takes place in methanol solvent with the presence of polyethylenimine nanocatalyst functionalized by nano-cerium methoxyborohydride at room temperature, and the product would be 4-methylbenzyl alcohol (b) (FIG. 23). FIG. 23. (a) 4-methylbenzaldehyde carbonyl group reduction to (b) 4-methylbenzyl alcohol. 4-methylbenzaldehyde IR and 1HNMR spectra are shown in FIG. 24 and 25. FIG. 24. 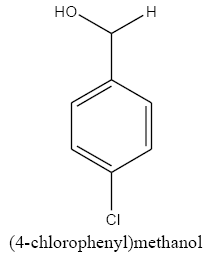 4-methylbenzyl alcohol IR spectrum. FIG. 25. 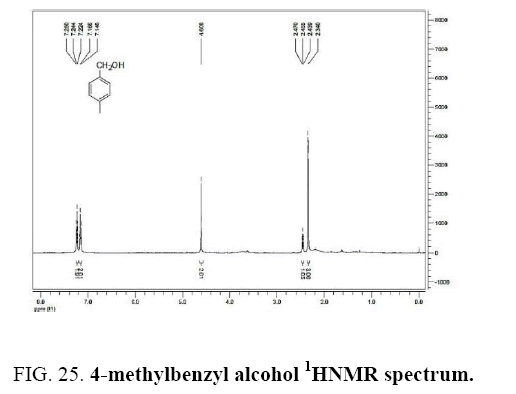 4-methylbenzyl alcohol 1HNMR spectrum. Benzophenone carbonyl group reduction (a) takes place in methanol solvent with the presence of polyethylenimine nanocatalyst functionalized by nano-cerium methoxyborohydride at room temperature, and the product would be diphenylmethanol (b) (FIG. 26). FIG. 26. 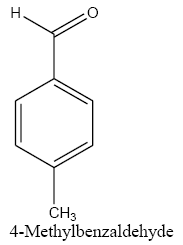 (a) Benzophenone carbonyl group reduction to (b) diphenylmethanol. 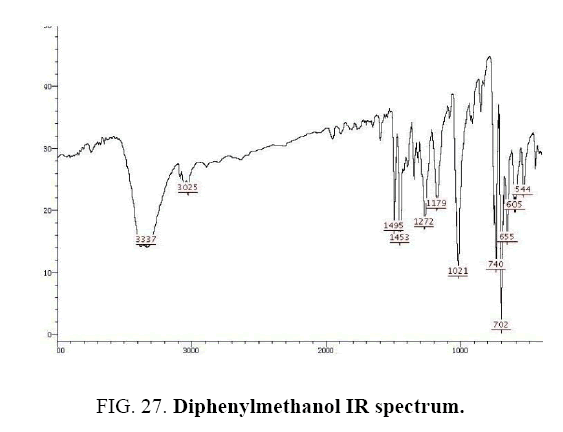 Diphenylmethanol IR and 1HNMR spectra are shown in FIG. 27 and 28. FIG. 27. 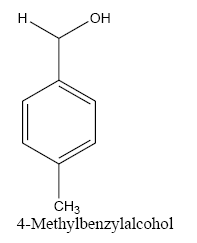 Diphenylmethanol IR spectrum. FIG. 28. 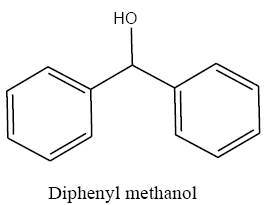 Diphenylmethanol 1HNMR spectrum. 3-metoxybenzyaldehyde carbonyl group reduction (a) takes place in methanol solvent with the presence of polyethylenimine nanocatalyst functionalized by nano-cerium methoxyborohydride at room temperature, and the product would be 3-metoxybenzyl alcohol (b) (FIG. 29). FIG. 29. (a) 3-metoxybenzyaldehyde carbonyl group reduction to (b) 3-metoxybenzyl alcohol. 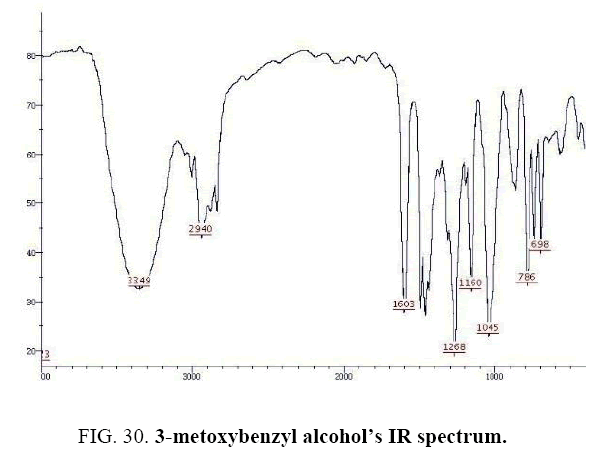 3-metoxybenzyl alcohol IR and 1HNMR spectra are shown in FIG. 30 and 31. FIG. 30. 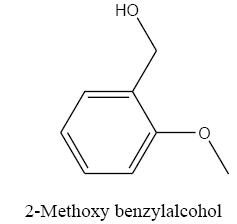 3-metoxybenzyl alcohol’s IR spectrum. FIG. 31. 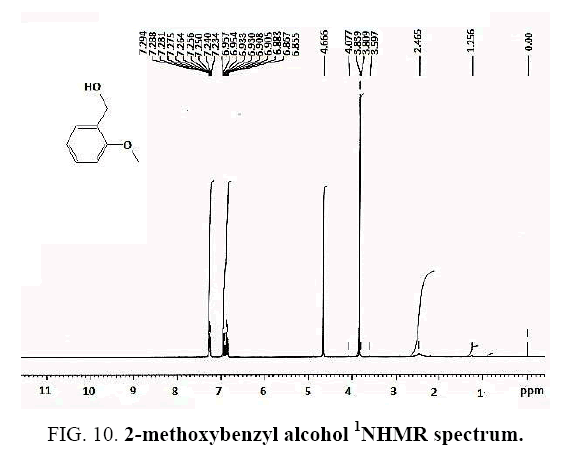 3-metoxybenzyl alcohol’s 1HNMR spectrum. Very unstable and cerium borohydride reducing reagent which is flammable in the environment may become stable through placing it on a polymeric substrate called polyethylenimine; then, this mild and new reducing reagent which is stable and could be kept for months in laboratory environment may be used in many organic synthetic reactions. This polymer functionalized with cerium borohydride reducing reagent is insolubale, in reaction environment. This reducing reagent acts selectively. 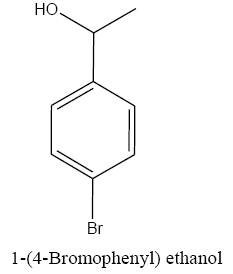 For example, C=C dual bond in reduction reaction of benzaldehydes remains unchanged. Obtained product would be easily separated and purified. Polymeric reagent’s retrieval would be easily performed, with no considerable reduction in its activity. 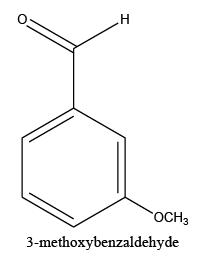 Polymeric reducing reagent produced with linear polyethylenimine will be prepared easier than the one produced with cross-linked polyethylenimine. However, carbonyl group reduction reaction to be performed through usage of reducing reagent prepared with cross-linked polymer would be easier; because, it is completely heterogeneous and may not be affected (even a little) by (solvent). With depositioning of CeCl3 nanoparticles on a polymeric substrate as polyethylenimine, properties of the nanoparticles may be improved through prevention of their agglomeration and concentration in one place. The reason is that, catalyst would have a larger effective area, which results in improvement of catalytic properties of this nanocatalyst. Polymeric reducing reagent prepared in the research may be suggested as a valuable compound from among numerous modified borohydride reducing reagents, reported in the papers. The difference is that, the reducing reagent used in the research is a borohydride exchange resin. Polyethylenimine being functionalized with CeCl3 nanoparticles is a retrievable polymeric catalyst which affects reduction reaction of carbonyl group; and, its retrieval procedure is very simple, with no considerable reduction in its activity. 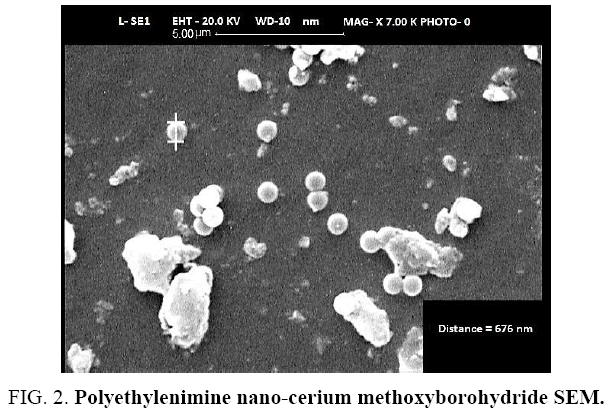 Polyethylenimine being functionalized with CeCl3 nanoparticles is insoluble in reaction environment which results in simple and quick separation and purification of products, that formed from reaction. Tamami B, Goudarzian N, Kiasat A. Polymer supported zinc borohydride as a chemo selective reducing agent for reductive acetylation of aldehydes. Eur Pol J. 1997;33(6):977-8. Kobayashi S, Manabe K. Special topic issue on green chemistry. Pure Appl Chem. 2000;72(7):1373-80. Hu X, Wang T, Qu X, et al. In situ synthesis and characterization of multiwalled carbon nanotube/Au nanoparticle composite materials. The J Phy Chem. 2006;110(2):853-7. Suda S. Method of manufacturing metal hydrogen complex compound. JP Patent. 2002;173306:2002. Bingham DN, Wilding BM, Klingler KM, et al. Method of forming a chemical composition. Google Patents. 2007. Boussif O. A versatile vector for gene and oligonucleotide transfer into cells in culture and in vivo: poly-ethylenimine. Proceedings of the National Academy of Sciences. 1995;92(16):7297-301. Sweeney P. Efficient therapeutic gene delivery after systemic administration of a novel polyethyleneimine/DNA vector in an orthotopic bladder cancer model. Cancer Res. 2003;63(14):4017-20. Venketeswaran S, Thomas T, Thomas TJ. Selectivity of polyethyleneimines on DNA nanoparticle preparation and gene transport. Chem Select. 2016;1(6):1144-50. Lungwitz U, Breunig M, Blunk T, et al. Polyethylenimine-based non-viral gene delivery systems. Eur J Pharm Biopharm. 2005;60(2):247-66. Urban-Klein B, Werth S, Abuharbeid S, et al. RNAi-mediated gene-targeting through systemic application of polyethylenimine (PEI)-complexed siRNA in vivo. Gene Therapy. 2005;12(5):461. Zintchenko A, Philipp A, Dehshahri A, et al. Simple modifications of branched PEI lead to highly efficient siRNA carriers with low toxicity. Bioconjugate Chem. 2008;19(7):1448-55. Fischer D, Li Y, Ahlemeyer B, et al. In vitro cytotoxicity testing of polycations: Influence of polymer structure on cell viability and hemolysis. Biomat. 2003;24(7):1121-31. Kurosaki T. Ternary complexes of pDNA, polyethylenimine and γ-polyglutamic acid for gene delivery systems. Biomat. 2009;30(14):2846-53. Shih L, Van YT. The production of poly (γ-glutamic acid) from microorganisms and its various applications. Biores Technol. 2001;79(3):207-25. Zhou X. Antitumoral efficacy by systemic delivery of heparin conjugated polyethylenimine–plasmid interleukin?15 complexes in murine models of lung metastasis. Cancer Sci. 2011;102(7):1403-9. Peng SF. Effects of incorporation of poly (γ-glutamic acid) in chitosan/DNA complex nanoparticles on cellular uptake and transfection efficiency. Biomat. 2009;30(9):1797-808. Peng SF, Tseng MT, Ho YC, et al. Mechanisms of cellular uptake and intracellular trafficking with chitosan/DNA/poly (γ-glutamic acid) complexes as a gene delivery vector. Biomat. 2011;32(1):239-48. Mousavi S, Esmaeili H, Arjmand O, et al. Biodegradation study of nanocomposites of phenol novolac epoxy/unsaturated polyester resin/egg shell nanoparticles using natural polymers. J Mat. 2015;2015. Ravanshad R. Application of nanoparticles in cancer detection by Raman scattering based techniques. Nano Rev Exp. 2018;9(1):1373551. Mousavi S, Arjmand O, Hashemi S, et al. Modification of the epoxy resin mechanical and thermal properties with silicon acrylate and montmorillonite nanoparticles. Polymers from Renewable Res. 2016;7(3):101. Mousavi SM, Hashemi SA, Jahandideh S, et al. Modification of phenol novolac epoxy resin and unsaturated polyester using sasobit and silica nanoparticles. Polymers Ren Res. 2017;8(3):117. Amani AM, Hashemi SA, Mousavi SM, et al. Electric field induced alignment of carbon nanotubes: Methodology and Outcomes. 2016. Hashemi SA, Mousavi SM, Arjmand M, et al. Electrified single?walled carbon nanotube/epoxy nanocomposite via vacuum shock technique: Effect of alignment on electrical conductivity and electromagnetic interference shielding. Polymer Composites. Hashemi SA, Mousavi SM. Effect of bubble-based degradation on the physical properties of single wall carbon nanotube/epoxy resin composite and new approach in bubbles reduction. Composites Part A: App Sci Manuf. 2016;90:457-69. Goudarzian N, Hashemi SA, Mirjalili M. Unsaturated polyester resins modified with cresol novolac epoxy and silica nanoparticles: Processing and mechanical properties. Int J Chem Petrol Sci. 2016;5(1):13-26. Mousavi SM, Hashemi SA, Amani AM, et al. Polyethylene terephthalate/acryl butadiene styrene copolymer incorporated with oak shell, potassium sorbate and egg shell nanoparticles for food packaging applications: Control of bacteria growth, physical and mechanical properties. Polymers from Renewable Resources. 2017;8(4):177-96. Hashemi SA, Mousavi SM, Faghihi R, et al. Lead oxide-decorated graphene oxide/epoxy composite towards X-ray radiation shielding. Rad Phy Chem. 2018. Mousavi S, Aghili A, Hashemi S, et al. Improved morphology and properties of nanocomposites, linear low density polyethylene, ethylene-co-vinyl acetate and nano clay particles by electron beam. Polymers from Renewable Resources. 2016;7(4):135.